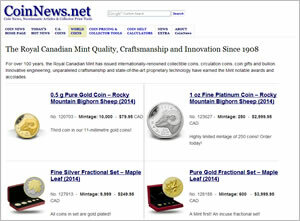 The Royal Canadian Mint notes strong sales of Gold Maple Leaf and Silver Maple Leaf bullion coins. Sales of the Silver Maple Leafs are now limited. Investor interest in silver bullion coins remains at high levels with yet another world mint showing signs that it is unable to meet demand. The Royal Canadian Mint is now rationing supplies of its 2013 Silver Maple Leaf. This move comes one week after the United States Mint suspended sales of their 2013 American Eagle silver bullion coins after inventories sold out, saying it would ration or limit orders when sales resume. Both series of bullion coins are struck for investors and guaranteed for weight and purity by the issuing government. "We are carefully managing supply in the face of very high demand for SML (Silver Maple Leaf) coins to ensure all our distributors are served and we continue to take sales orders," states Alex Reeves, RCM Senior Manager of Communications. 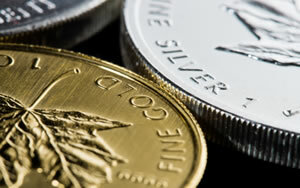 "Coming off strong sales volumes in December 2012, demand to date remains very strong for our Silver Maple Leaf and Gold Maple Leaf bullion coins. Specific (sales) numbers will be made available at our regular reporting intervals." In short, in 2012 it moved 12.7 million bullion coins through the third quarter. The U.S. Mint through the first nine months of 2012 notched Silver Eagle sales of 25.795 million. With that, an idea of recent Silver Maple Leaf demand may be inferred from recent U.S. Mint’s sales of Silver Eagles. 2013-dated American Eagle silver bullion coins launched on Jan. 7, 2013 and racked up record sales of 3,937,000 coins in one day. In less than two weeks, sales totaled 6,007,000. It was at that point when the U.S. Mint announced it needed to rebuild its inventory. As for the Canadian Silver Maple Leaf bullion coins, investors and collectors will likely have to wait for the Royal Canadian Mint’s first quarter sales report to get an idea of the triggering demand level for its rationing process. Silver prices have been too low or a long time. Physical supply runs short. I look forward to physical demand overrunning supply, creating a price surge. And I hope JPM loses a bundle as it gets caught in the biggest short squeeze in history. Jamie Dimon’s gonna be whinin’. And I’ll be smilin’. 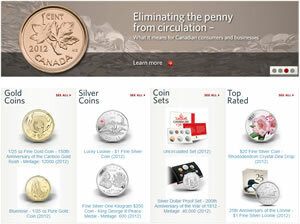 So the US Mint is out of silver & the Canadian Mint is out of silver yet the price of silver continues to fall. Obviously this trend can not and will not continue. The price of silver will explode.